Pros: Good value, quality customer support via several channels? InMotion Hosting is a web hosting company providing very basic hosting, business hosting, virtual private server hosting, and dedicated server hosting. The hosting company was founded in 2001 and has since garnished many awards for its service. In this review, we will examine InMotion Hosting’s most basic hosting packages and see if their hosting services truly shine as bright as the awards page. For this review, we are testing the Basic plan. Often times the differences between a host’s plans in the same category are minimal, yet with InMotion Hosting it is very important to consider what you specifically need. One doesn’t really need to consider the amount of disk space and bandwidth as the amounts provided far exceed what the average hosting customer will use. InMotion Hosting has created hosting plans that selectively impose limitations. For customers who might be new to hosting and are looking for a built-in website builder, it is important to notice that InMotion Hosting does not include this feature on their Starter plan, but it is available on the Basic and Max hosting plans. For those interested in dynamic, database-driven websites, which would be any content management system (WordPress or Drupal, for example), it is important to note that the Starter plan does not offer any MySQL databases. Most websites today require databases to function, unless they are simply composed of static pages. The Starter plan also does not support Flash, so not only must pages be static, but it is also not possible to provide Flash content. There aren’t many differences between the Basic and Max plans. The additional features offered in the Max plan include the ability to host additional domains, another database, additional FTP accounts, email SPAM protection, additional e-commerce features including the availability of a merchant account, website statistics, and access to raw log files. None of the value plans support subdomains, so it’s not possible to have something like help.example.com. All three plans permit PHP, Perl, and CGI scripting. For the average customer, the Basic plan would probably work well. The monthly pricing for the three plans is $3, $4, and $5, respectively. The only billing cycle available for the Value plans is 24 months, so two years of hosting must be paid up-front. Most hosts offer more flexible billing terms than this, but this hosting is quite inexpensive. InMotion Hosting provides a 30 day money back guarantee, which is comparable to many hosts. With the two-year billing cycle, if a customer cancels after that guarantee period they are not refunded for the remaining time. For example, if a customer cancels on day 31, they would still be paying between $69 and $115 for the other 23 months of hosting. Some hosts are willing to provide a pro-rated refund for unused hosting. Although not reviewed here, InMotion Hosting also has other services including “business class” hosting, virtual private server hosting, dedicated hosting, and web design. InMotion Hosting’s terms of service are quite standard. As I read through them, there were no terms that stood out or were in anyway abnormal; the content was pretty straight-forward. Like many hosts, InMotion Hosting does not permit pornographic material, IRC chats, torrent software, proxies, etc. to be hosted. Another thing to note is that there is no stated uptime guarantee. Many hosts will provide about a 99.9% uptime guarantee. 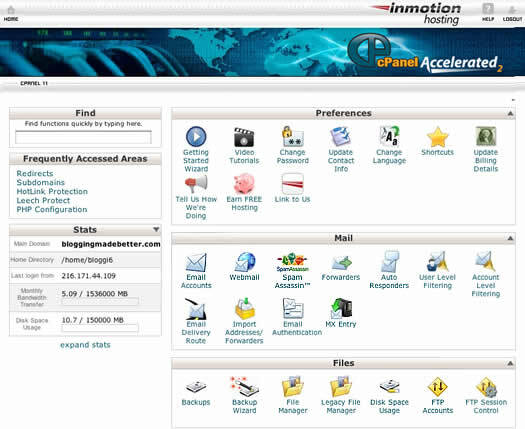 InMotion hosting, like many web hosting companies, provides the industry-standard cPanel control panel. Upon logging in, the instance of cPanel provided looks similar to most any other. There are areas for managing preferences, mail, files, logs, security, domains, databases, software/services, and advanced features. 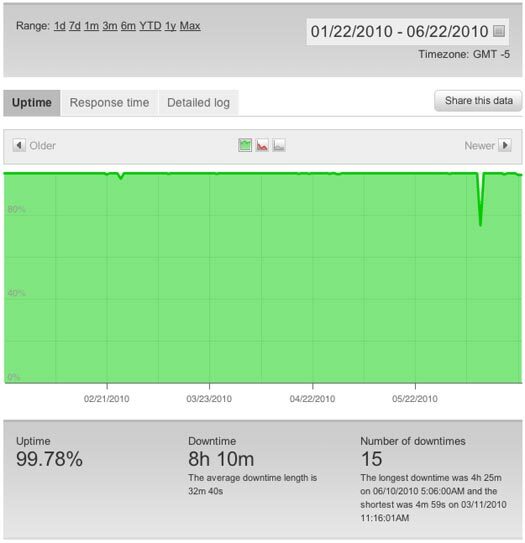 Pingdom, an uptime monitoring service, was used to obtain these statistics. Many hosts guarantee 99.9% uptime, and InMotion Hosting does not demonstrate the ability to provide this, though their uptime is likely acceptable for most customers. Using cPanel’s graphical interface makes it quite simple to manage everything including email accounts, files, website statistics, and databases. After signing up, I received a handful of emails along with a phone call. Within about 10-15 minutes after placing the order for my hosting account, I received a phone call confirming my account. Since the domain I signed up with had the word “blogging” in it, the representative calling recommended that I consider upgrading to the business-level hosting as the Value plans were “about 50% slower” and he also noted that my plan only provides one MySQL database. I asked if it was possible to later upgrade and I was assured that I could. The first email I received stated that my order was being processed and that I should expect an email or phone call to confirm it, which I did receive, as noted above. After confirming my account, I then received a welcome email with my account details and steps to get started along with another email serving as a receipt of my order. The welcome email was full of helpful information providing all account details, how to get started, and where I could go to find support. This information is invaluable for those who might be unfamiliar with hosting, and is useful for any hosting customer. The first thing I wanted to do was to set up a blog on my website. The Fantastico auto-installer is often available in cPanel. Using this interface, it is simple and fast to install various online applications including systems to facilitate blogs, classifieds, content management, discussion boards, and more. I selected WordPress and the option for a new installation. On the next page I only had to fill in a handful of fields and then I clicked to install my blog. After confirming my selections, my blog was instantly created. Since InMotion Hosting does not explicitly imply a statement or guarantee of uptime, it is important to consider what customers can expect to get if they sign on. 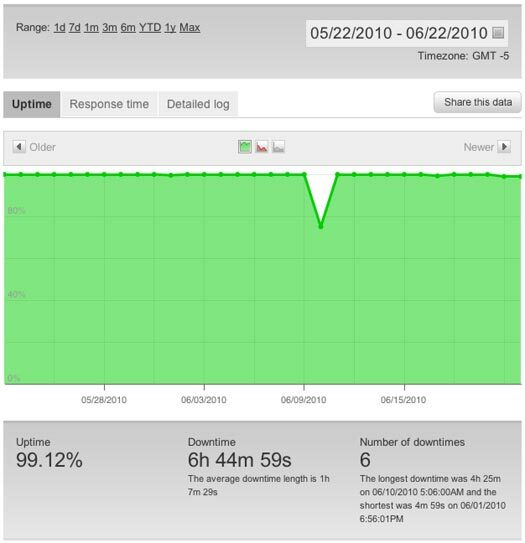 During the month before writing this review, my InMotion Hosting account experienced 99.12% uptime with about 6.75 hours of downtime over six different occasions. The longest instance of downtime was about 4.5 hours. This might be atypical since the uptime across five months was 99.78% and that same 4.5 hour instance was the longest during that period. InMotion Hosting provides 24/7 technical support. There are a handful of support channels available including phone, email, live chat, knowledge base, help desk, and forum. Effective phone support can often be a very defining factor for a host. Just after noon on a weekday I called InMotion Hosting customer support. Immediately after dialing the number I was connected to an automated gateway informing me that I had reached InMotion Hosting and that my satisfaction was guaranteed. I pressed 2 for technical support and within less than 30 seconds I was connected to a representative. The representative simply asked how he could help me, and didn’t require any upfront information regarding my account, which is convenient when you simply have a general question as I did. The representative was very easy to understand and I was very confident that he was in-house, or at least within the United States. I told him that I had just set up a WordPress blog and was interested to know if I could redirect my domain name to point directly to the directory that my blog was in, as I had placed my blog in /blog. So I wanted it to redirect from example.com to example.com/blog, for example. He instructed me that what I wanted was found by clicking “Redirects” under the “Domains” section in cPanel and he then guided me through setting up the redirect. At the end of the call he asked for my primary domain name for “documentation purposes.” The call time was about 3 minutes and 30 seconds. I was quite satisfied with the phone support I received. I decided to test out their live chat next. At about 12:30 PM the same day, I initiated a live chat with an InMotion Hosting representative. After inputting my name, email address, and question I was informed that there were three chat requests before me. I figured I would probably need to wait a few minutes, but it was only a minute later when I was connected to a representative. I was first asked for my primary domain name. About a minute later the representative thanked me and then took another 30 seconds or so to inform me that I was describing what is known as “hotlink protection.” He then provided me with a link to a page listing the video tutorial for setting up hotlink protection in cPanel. The total length of the chat was approximately five minutes. I watched the video tutorial and it guided me through enabling the hotlink protection. Although it might be frustrating to some customers to be sent to a tutorial instead of being instructed by the representative, the video tutorials are effective in showing exactly how to work with cPanel, and are likely much easier to follow than written instructions. InMotion Hosting’s Value plans do indeed provide good service at a value. Ideally the required billing cycle would not be as long as 24 months as that is quite a long-term payment. It would also be nice if they provided an uptime guarantee, but they do provide about 99% uptime. With the industry-standard cPanel control panel and quality customer service, InMotion Hosting seems quite solid. Disclosure: Clickfire has an affiliate advertising connection with InMotion. Kyle is a skilled web developer who writes web hosting reviews and host vs. host comparisons. In addition to InMotionHosting’s entire system being hacked and every customer’s site showing it had been hacked this past year, plus their countless down time, they recently installed server limits machinery with limits not advertised anywhere when you sign up. If you own a WP blog they fail to tell you that your blog may not be suited for even the business plan. My site gets less than 1,000 uniques per day with most of the content in html, plus it used WP supercache, and yet the WP blog element is pushing the site over its limit regularly and causing page elements not to be served. Customers will try to see your blog and receive blanks or X where photos and images should be. I honestly can’t recommend this company. You should keep looking. Try googling InMotion Hosting and you’re sure to find what I did last year when I began a new search for what I hoped would be my last web hosting provider. I couldn’t find anything bad said about them! As a matter of fact, there wasn’t much about them at all with the exception of their site’s info being listed. I even checked many of the popular web hosting forums and zilch! Most had not even heard of InMotion. The few that had really had nothing to offer outside of rumor or gossip. I found this to be a pleasant surprise and went to their web site to have a look around. What I found was, in my opinion, a possible place to host my sites long into the future. They’ve been around since 2001 and the fact that to this day, one cannot find hardly anything bad said about them speaks volumes. Especially in this day and age of ‘dogging out’ any web host who, in a customer’s view, has done them a disservice. InMotion Hosting, like many others out there, offers several plans to choose from such as Dedicated, VPS, Business Class Hosting and Personal/Cheap Hosting. In keeping with the rest of the competition, upon deciding on what plan best suits your needs, InMotion offers you the opportunity to upgrade at any time as your needs grow. What impressed me is their Support Teams are right here in the USA. Seeing as I’m in the US too, that’s a plus for me. They can be reached in several ways too like toll-free phone, email and Support Ticket. What little I’ve needed to contact Support has been done in way under an hour. I give their response times top marks. I’m not referring to the auto-response email either but their actual response from an actual person. No canned replies either. The ones I’ve received were personable and tailored to my particular issue. They have 2 DC’s (data centers) now on opposite coasts which to me makes a lot of sense. One is in Los Angeles, CA and the other is in Washington, D.C. They even allow subscribers of their VPS and Business Class hosting plans to choose which DC to host their data in. They call it their ‘Max Speed Zone Enabled’ offer. I won’t get into the technical details of the how’s and what for’s but as a testimonial to the perceived speed increase, I asked that my data be transferred from the west coast DC to the one on the east coast upon discovering this new feature that InMotion offered. I actually just asked about it in a Support Ticket and they told me that it’d be no problem at all. This was after being hosted with them for around 8 months at the time. No charge for the move either! Needless to say, I was again impressed. And the perceived increase in speed? They were right on with it too. My site’s load times decreased markedly plus my emails seemed to follow suit. Two of my sites are WordPress installations, one of which has a fair amount of traffic. I know there’s a lot of web hosts out there. Many of them are resellers. Some are good, some are bad and some just plain outshine the rest. This last category is the one I’d place InMotion Hosting in. So much so that I became an affiliate for them. I don’t see much traffic for it and to date haven’t had anyone sign up to my knowledge off of the affiliate link. But still, I’m impressed enough to advertise for them on my site. Call me biased if you want but when you find a good deal, especially in web hosting, you let others know! In a nutshell, InMotion Hosting is the sleeper race car of the web hosting industry! You don’t think much about it until you notice that what they’ve sold you is what you’re paying for. In other words, you’re getting your money’s worth and a whole lot more. On a side note, I don’t work for InMotion Hosting nor am I being paid to write this for them or in their behalf. I just think that much of them and in this era of always seeing the bad about people and companies, to me, it’s nice to see the good about them from time to time too. I’ve been testing InMotion hosting similarly for a few months now, and on most categories they are just average. But one that sticks out is uptime – last month they had another 100% uptime month, which is hard to find these days. Inmotion can’t restore backups older than one week. I just learned (the hard way).